My sons are at an age in which they no longer have big, themed parties with their friends that include the time-consuming but oh-so-fun-to-make themed birthday cakes, like when they were younger. But for his birthday this year, my younger son had no idea if he wanted to eat out, have take-out pizza, or something made by yours truly. He wasn’t even sure what type of cake he’d like to have. Finally, he asked me to surprise him. 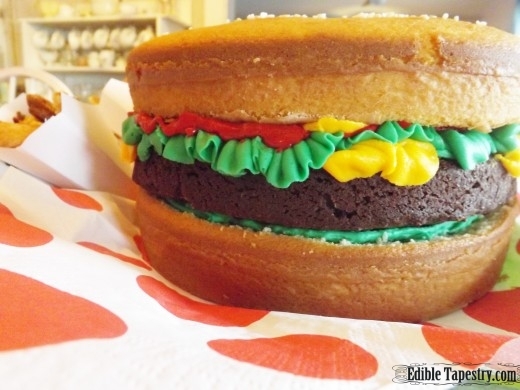 I remembered a burger cake I bought from a grocery store bakery for my husband’s first first Father’s Day, back before we even had kids but were expecting our first. He’d sent me a bouquet of flowers for Mother’s Day, and I wanted to do something fun for him, too. 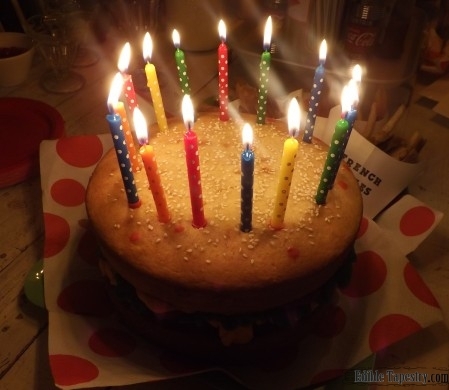 The cake had layers with a “meat patty” in the center, tomatoes, ketchup, mustard, cheese, and lettuce piped on with frosting, and two big “buns” made of air-brushed yellow cakes. 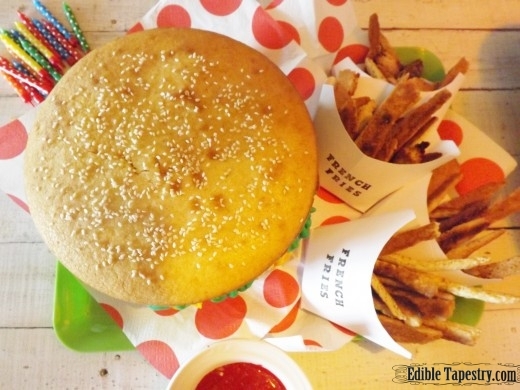 A pile of “french fries” came with it, cake fingers, toasted and served with red frosting “ketchup” for dipping. When I described it to my older boy, he liked the idea, so we decided to try to make one for his brother. We used card stock to make french fry holders using a template we found online, and stamped them with rubber stamps. Then I made soda jerk hats using more card stock that we could all wear for party hats. I painted stripes on them with glossy red paint and named our “diner” after my son by putting his name in front of the word “Diner” on our hats in a retro diner font. 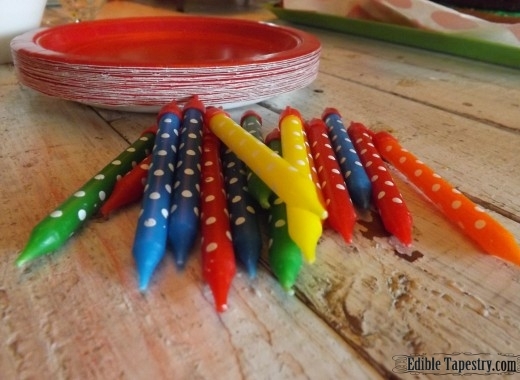 When I found polka dot balloons at Target to hang all over the place, and polka dot candles and napkins, I knew we needed to take our “little guy” to The Poky Dot for breakfast the day we were celebrating. It’s a 50s diner we had been to once before that’s decorated in crazy colors and retro greatness, with polka dots everywhere. Of course I served real burgers and fries with the cake. And we had DIY sundaes instead of regular ice cream. Because the cake had so little frosting on it, we found that we really needed that ice cream to moisten it up. 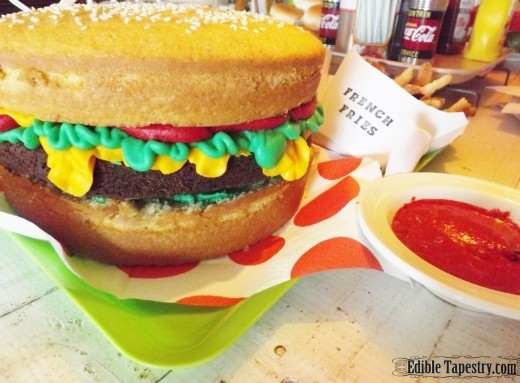 All you need to make a burger cake is two layers of yellow cake and one of chocolate. I threw together a basic yellow cake and used half of my Mocha Brownie Bites recipe baked in a round cake pan for the “patty” layer that went in the middle. I brushed the top of the layer that I wanted to look like the top bun of the “burger” with water then sprinkled on sesame seeds so it really looked like a bun. Then I whipped up a big batch of buttercream frosting, divided it into three portions, and tinted one yellow, one green, and one red, the largest being red so we could use it as “ketchup” for our sugar cookie fries. I put the layers together and squirt on the “lettuce”, ‘cheese”, “ketchup”, and “mustard” with leaf tips from my Wilton cake decorating set. So easy and SO much fun! He was surprised and we all had a blast! Cream the butter with a mixer. Add the sugar. Mix until light and combined. Add the eggs, one at a time and beat until light and lemon colored. Mix in the vanilla. Combine the milk and the sour cream. Sift together the salt, baking powder, and flour. Add the milk and sour cream mixture alternately with the dry ingredients until combined. 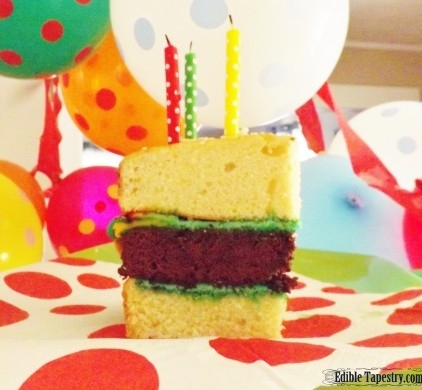 Pour into two greased and floured 9″ round cake pans. I filled one higher than the other so the top would round when it baked. Bake for 20 t0 25 minutes. Cool in pans on wire racks for 10 minutes. Invert onto racks to cool completely. Combine all the ingredients to make a stiff dough. Refrigerate one hour. Roll the dough out on a floured surface to 1/2 thick. Use a pizza wheel for straight-edged fries, or a pie pastry cutter to make wavy fries. I cut them all different lengths. Place on cookie sheets two inches apart. Bake till golden brown, 7 to 10 minutes. Trim the top of one of the yellow cakes to level it flat. Leave the other rounded. Place one layer of yellow cake on a cake plate. 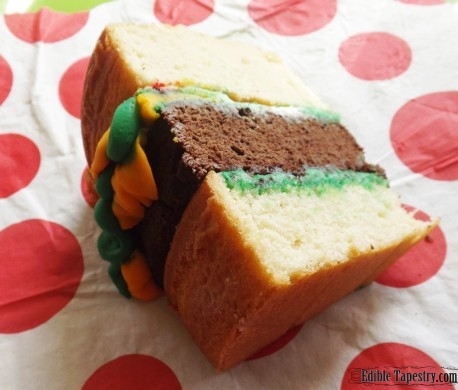 Spread icing of any color on top, but keep it away from the edges so it won’t show. Add the chocolate layer that simulates a meat patty. Spread with frosting, keeping it away from the edges. Add the top layer, the one with the sesame seeds. 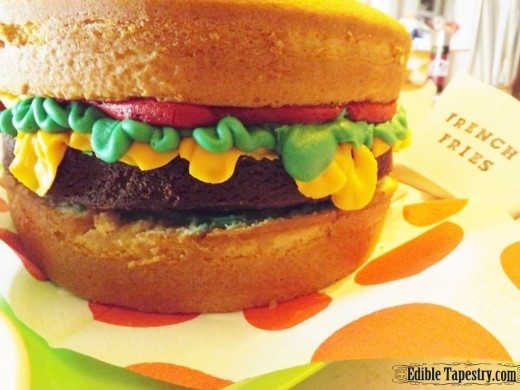 Squirt frosting on the edges, where the patty and the top bun meet to simulate ketchup, cheese, ketchup, and lettuce.